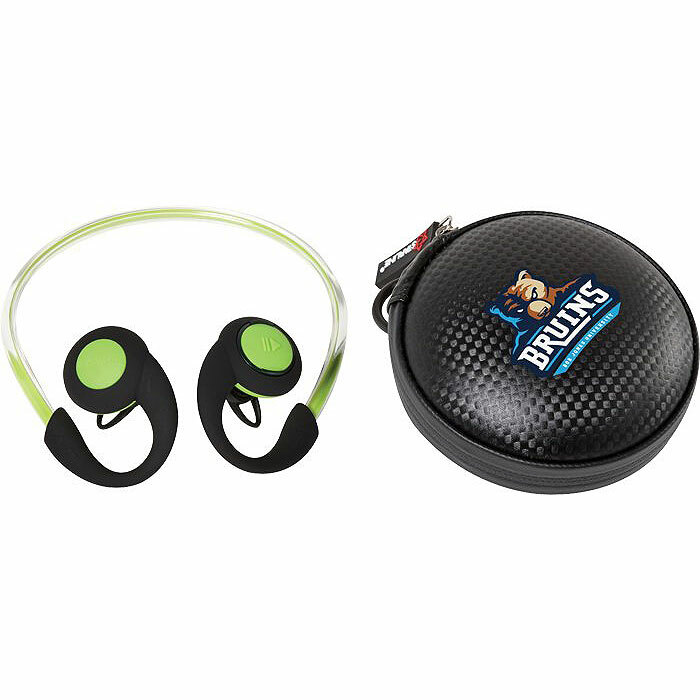 Product code: 22579 Category: Speakers & Headphones. Be trendy with this Bluetooth speaker. 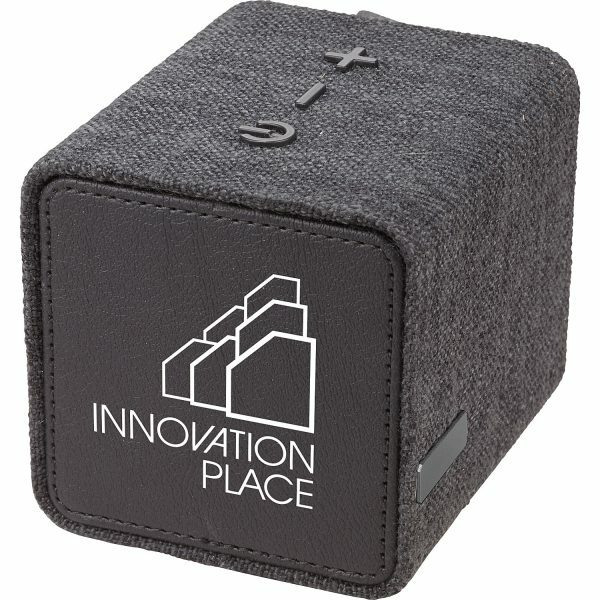 Featuring a knit fabric cloth the speaker has a soft touch, but don’t let that fool you it comes with a 3 watt speaker driver. 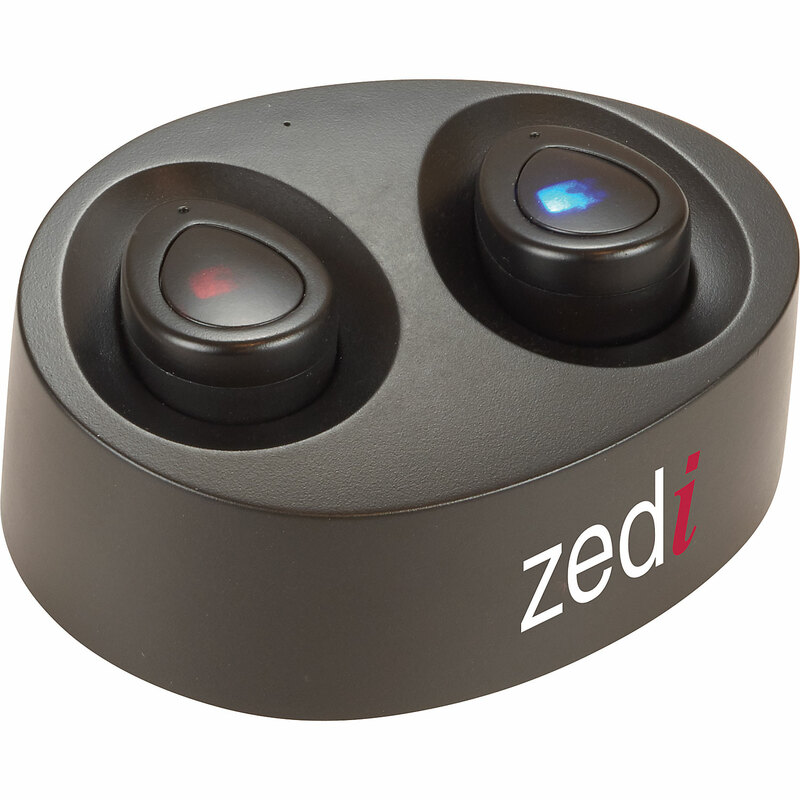 With a built-in microphone you can have a conference call without even touching your phone. You can control the music and volume right from the speaker with the built -in music control. With a Bluetooth working range of up to 33 feet the speaker comes with a micro USB to USB charging cable and a 3.5mm audio cable. Enjoy 3 hours of playback time at the max volume, the speaker has a charging time of 1.5 hours. Size Choose an option4 in. x 4 in. x 4 in. 4 in. x 4 in. x 4 in. The perfect gift for the constant traveller these micro truwireless earbuds take it to the next level with the powercase. The carrying case doubles as a charging station perfect for when you're on the move. The case is able to charge the earbuds from 0-100% two times. The ergonomic design of the earbuds helps to keep them in place while you're on the move. They have over 2 hours of playback time and a charging time of 0.5 hours for the earbuds and 2 hours for the case. 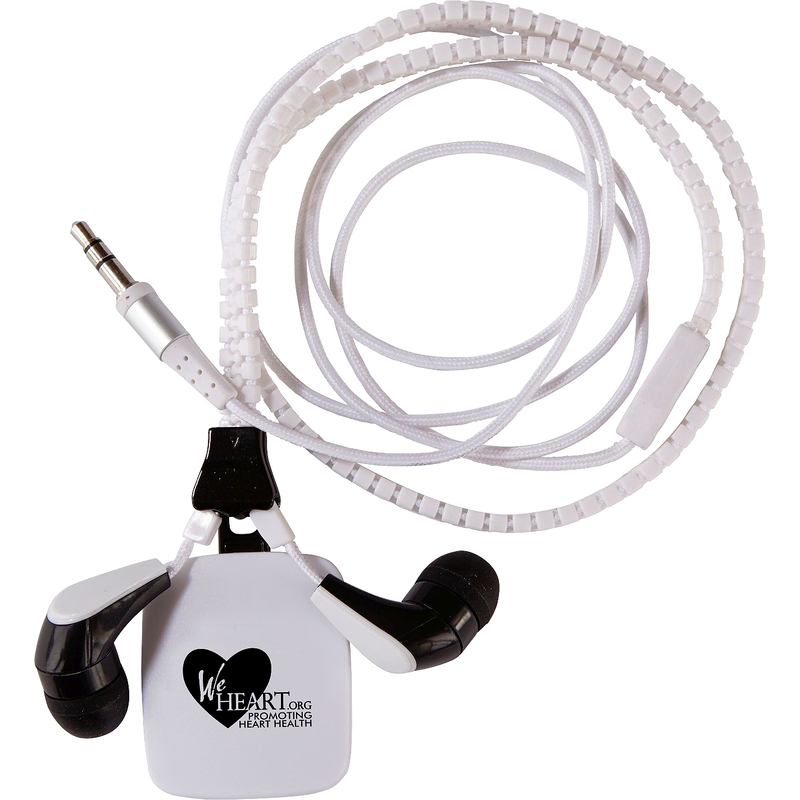 The earbuds have a Bluetooth working range of up to 33 feet and come with a charging cable and small/medium ear tips. Heat things up with these sweat-proof sportspods with an IPX6 rating! The boompods Bluetooth earbuds feature an illuminating headband with different light modes: flash fast, flash slow, permanently on or off. Pair with 2 Bluetooth enabled devices at one time and easily control music and calls with the integrated microphone, volume and track control to adjust volume, skip songs, and take calls. 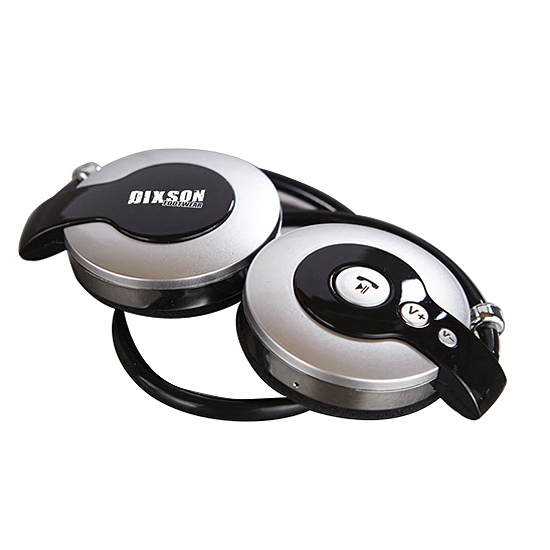 They have a listening range of 10 m/33 ft for up to 7 hours straight with a 2-1/2 hour recharge time. 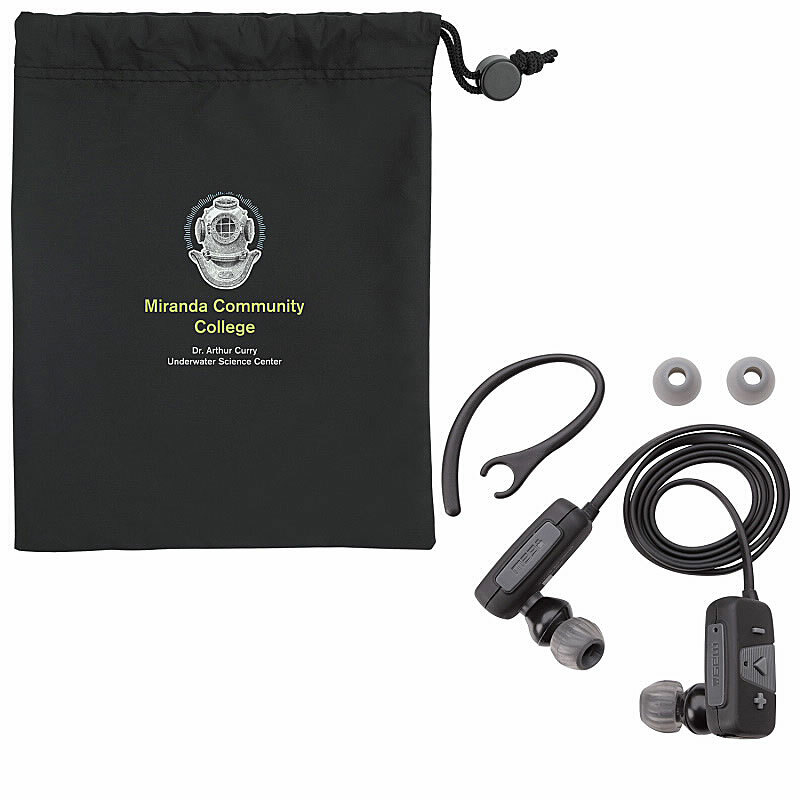 Includes ERGO Grip earbuds in 3 different sizes, micro USB cable for recharging, and instruction manual. Comes with a water resistant EVA case. Get the party started wherever you go with the bump Bluetooth speaker. The compact size of the speaker makes it portable so you can take the tunes anywhere. With a Bluetooth working range of up to 33 feet this speaker has 2 hours of playback time at the max volume and a charging time of 1 hour. Cut the cord with the ATOMÂ - one of the smallest wireless earbuds in the world and you only need ONE! 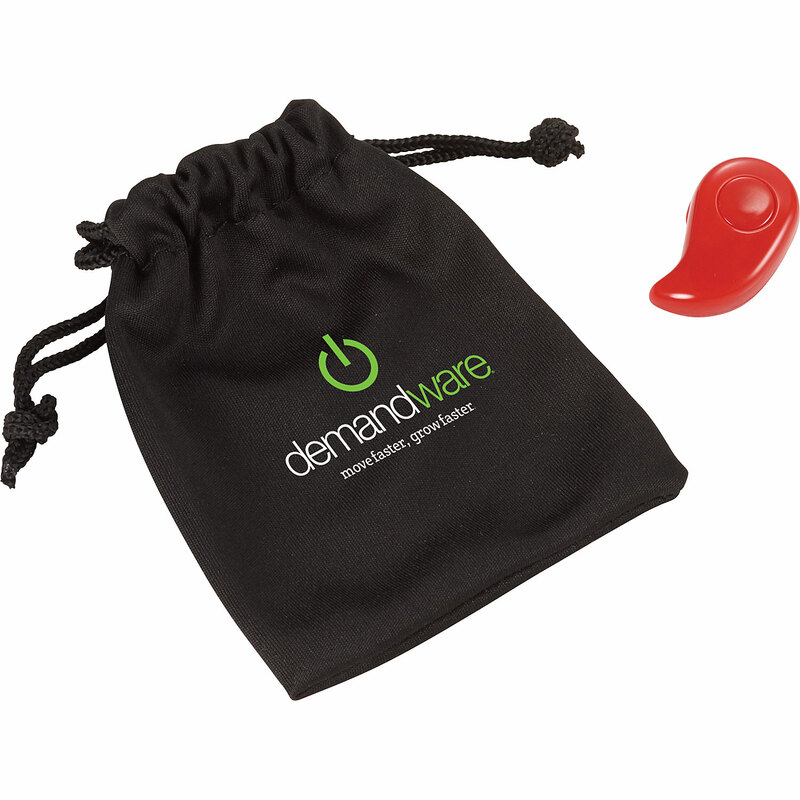 No more tangles, knots or frustrations with your earbuds with this easy to use and easy to store headset. Enjoy fantastic sound quality while listening to your favorite music, podcast, news, GPS navigation, or even while on a call with the built-in microphone. Keep alert and safe while exercising, driving, at work, cleaning up the yard, or hanging out in a group. The tiny discreet design looks similar to standard earbuds, but it's a headset too: Let ATOMÂ be your personal in-ear assistant with on/off, play/pause, and activate voice control. The brilliant full color graphics is the control button allowing you to power the SOLOÂ on/off, play/pause, and activate voice control or even Siri or Google with the simple press of a button. Call a contact, sent a voice text message or email, set reminders, post to twitter and more. Answer or decline incoming calls by simply saying yes or now. Avoid tangled cords! These earbuds help you out by just zipping them up. They feature a tag for great logo display and also come with a handy carrying case. Take your entertaining to another level with this speaker. 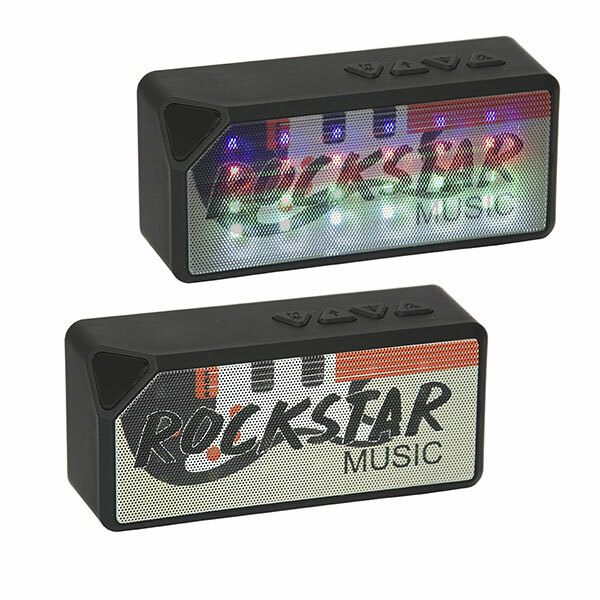 It features a disco LED light that flashes in time with the bass of your music. 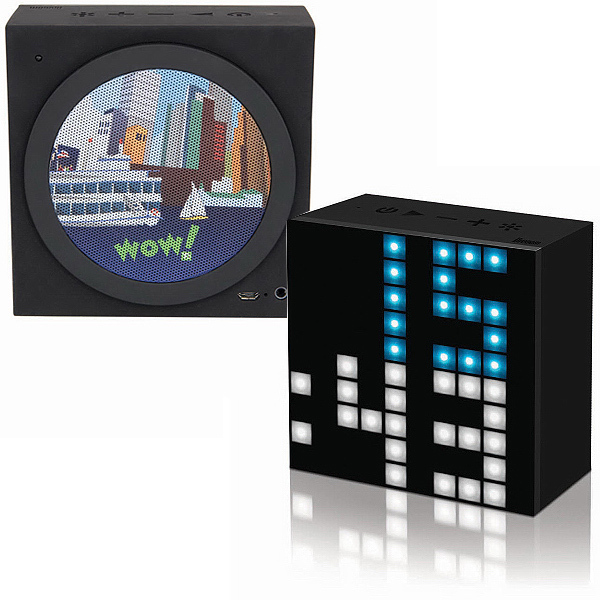 The illuminated speaker creates a light show right on your desk or table. 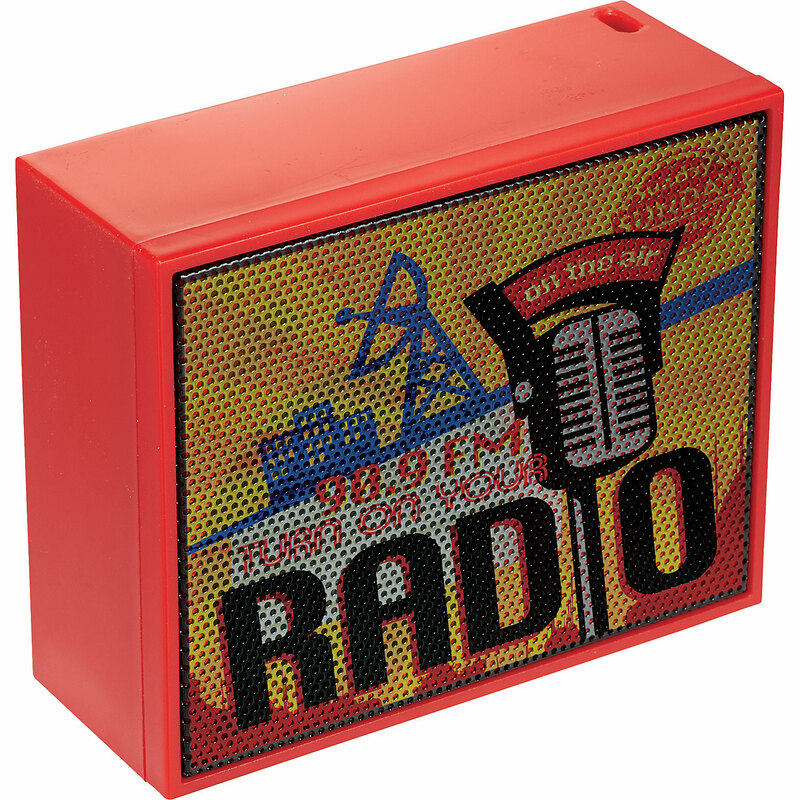 This 3.0V 3 watt wireless speaker made from ABS plastic includes a USB/SD slot, FM radio and an auxiliary line, with an on/off button on the back the speaker has a 33 foot wireless range. This FCC certified speaker has a play time of up to 2 hours and includes a rechargeable battery. It also bas the ability to connect your Bluetooth® enabled devices. This makes it the perfect appreciation gift! Connect wirelessly to any Bluetooth® device in a 50 foot range! These mini earbuds charge for one hour to provide up to 7 hours of play time. Features on-board controls to easily switch tracks, adjust volume, and take calls. They are sweat resistant to last through workouts and daily activities. Includes ear hooks and multiple ear tips for a custom fit. The magnetic connection secures buds around neck when not in use. The best desktop notification system around! The Aurabox is an all-in-one Bluetooth speaker with a built-in microphone, LED lamp, digital creative palette, thermometer, smart alarm clock, and notification system. Explore your imagination with this smart, uplifting, creative, and innovative tech-gadget that will keep you inspired by light and sound. Through the device you can keep in touch with social media while listening to your favourite tunes in exceptional high quality. The Aurabox comes with an app so you can rock out to your own designs with the brilliant LED lights to set the atmosphere. Bluetooth capability up to 33 feet, 6 hours of play, and pop-up icons when texts, emails, and calls are received. Wireless earbuds are all the rage right now and the true wireless earbud and mic is the perfect gadget for the techies out there. The earbuds are capable of answering calls and listening to your favourite music. It's as easy as pushing a button. That's all is takes to make a call or play your favourite new song. They have a playback time at max volume of 1.5 hours and a charging time of 1.5 hours. 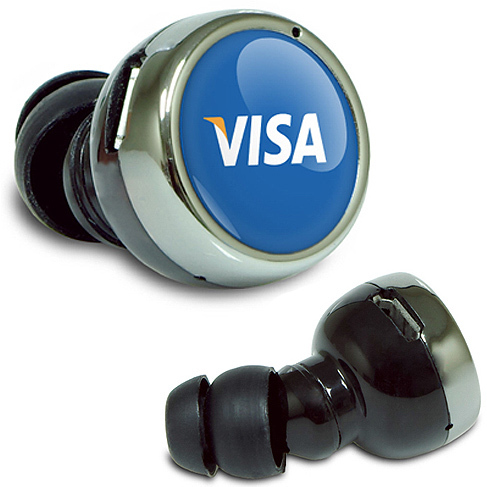 They are compatible with any Bluetooth device with a working range of 33 feet. A charging cable and pouch come included. Great sound at a great value! This sports neckband headset is Bluetooth compatible allowing you to listen to your favourite tunes or use them as a phone headset. They fold up into a very small space for travelling.